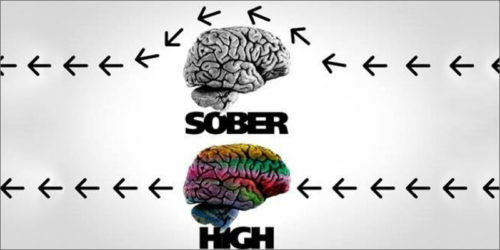 Sobriety Bias Syndrome is the tendency for people to erroneously assume that, if there are two competing perceptions of reality, the one that was arrived at while sober (or the most sober) must necessarily be the correct one. This line of thinking has retarded our cultures and had a grossly retrograde effect on our spiritual awareness. The logic behind this is usually given thus: psychoactive drugs disturb the normal thinking processes of the brain, and these normal processes have evolved to make us optimally adapted to the environment around us, therefore without the influence of psychoactive drugs we will remain in the undisturbed and pure state best suited for accurately perceiving the material world. This state is known as sobriety, and the term has become a synonym for clear-headed and rational thinking. It is a very strange belief if one examines it, because it’s not clear what sobriety actually is. Our everyday experience of reality is formed by the interactions of several dozen neurotransmitters in our brains – and that’s even if we don’t smoke, snort, swallow, insufflate or shelve anything. Even in a state that most people would consider to be fully sober, the conscious experience is strongly influenced by these neurotransmitters. Dopamine, serotonin, oxytocin, GABA, adrenaline, and dozens of others exist, and our mood at any time is mostly a function of the complex interactions between these. So a sudden spike or trough in any of them can cause a profoundly different mood or attitude – an experience as strong as any “drug” trip. Not even by meditating can one arrive at a state in which one is not influenced by these neurotransmitters. Meditation might help to inhibit the release of some of these natural drugs (especially noradrenaline), but in doing so it will merely facilitate the release of others (especially serotonin). In other words, meditation advocates can legitimately be accused of being mere 5-hydroxytryptamine junkies. Because one is always under the influence of these neurotransmitters, no-one has any way of knowing what sobriety even really is. The usual assumption is that the average, everyday or most common experience must be the natural one and therefore the state in which one does the most rational thinking. But no person, even if they have definitely not taken any external drugs into their body, has any way of knowing whether their natural neurotransmitter levels are correct. Many, many people have near-permanently elevated levels of noradrenaline and adrenaline as a consequence of all the stresses of living in a city, which is an extremely unnatural environment and which does not give people in it much opportunity to relax and to find homeostasis of anxiety levels. It’s very plausible that these elevated levels of what are essentially endogenous war drugs have pushed us into a collective stupor in which we no longer can make decisions with an intelligent long-term perspective. It’s easy to believe that we are so full of adrenaline that we can only make decisions with immediate rewards in mind, because this would explain the obesity, violence, callousness and stupidity that characterises our societies. So we’re already not making sober decisions, and so changing the drug laws to reflect that exogenous drugs are not categorically worse for a person than endogenous ones will not necessary lead to the breakdown of social order. In fact it could be argued that some exogenous drugs – and cannabis is the obvious example – actually serve to reduce the levels of some harmful or stupefying neurotransmitters and therefore cause the smoker to become more rational (this is why Rastafarians call their smoke-ups reasoning sessions). Sure, we don’t need surgeons taking a hit on the crack pipe before they operate, but a change in attitudes to exogenous drugs need not lead to change in attitudes to professional workplace conduct. The truth is that people arrive at all kinds of enhanced insights that can be, and have been, used to improve the quality of human life as a consequence of a drug-induced altered state of consciousness. After all, how else would they do it? Novel solutions demand novel thinking. Novel thinking is certainly not achieved by repetitively going over the same neural pathways for years and years on end. Some thinkers, like Terence McKenna, even credit the use of psychoactive drugs for much of the initial impulse to civilise our species and for the first stirrings of spirituality in the human creature. It’s also an open secret that much of the creative technological thinking that made reading this website possible was sparked by LSD. The Sobriety Bias Syndrome, a kind of Puritanical abuse of the bandwagon fallacy, makes all of these insights harder to achieve by binding people’s thinking to the most mundane, banal, plebian simplicities that can be devised. The sobriety bias is usually promulgated by a decidedly mediocre sort of person, best characterised as being incredibly boring, and sufficiently so to have long since driven all interesting people out of their social circles.